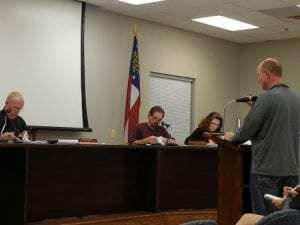 BLUE RIDGE, Ga. – Animal activists and members of local animal rescue groups were present to have their voices heard again at the Nov. 28 Fannin County Board of Commissioners (BOC) meeting. Taking the opportunity to speak during the public commentary portion of the meeting, residents addressed their concerns to the board. One resident spoke of the need for the inside of the animal control facility, located at 1001 Fannin Industrial Park in Blue Ridge, to be painted and updated. Jan Eaton addresses the board holding a crate tray that she received from FCAC. The tray was visibly broken in two. 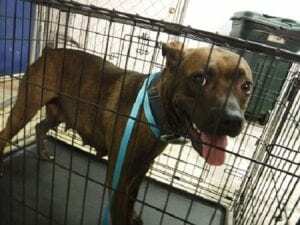 “It is pretty sad that this is the best our county can do for the animals at animal control,” Eaton added. Eaton went on to point out that at all of the meetings she has attended, department heads often speak to the board asking for specific needs for their department, and that she has yet to see FCAC Department Head John Drullinger do so. Stating that the board spends “millions here and there,” Eaton said she thinks that the needs of FCAC are often overshadowed by other projects. Earlier this year, the Board of Commissioners approved upgrades to the animal control facility. BOC Chairman Stan Helton and Post 2 Commissioner Larry Joe Sosebee voted to install guillotine doors to the existing kennels; Post 1 Commissioner Earl Johnson abstained from voting on this issue. The approved improvements called for fourteen outdoor runs to the facility, as well as guillotine doors to allow the dogs to access these runs from their indoor kennels. Ralph Garner, of Blue Ridge, also spoke during public commentary. Wanting to see changes take place at FCAC he urged Johnson and Sosebee to take action. Photo from FCAC Facbook page showing a dog temporarily housed in a FCAC crate. Garner’s appeal did not go unnoticed. 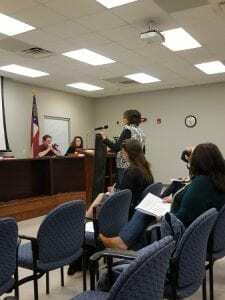 As the meeting came to an end, Sosebee spoke up about issues that were raised concerning animal control and addressed Eaton’s display of the broken crate tray. When FCAC is filled beyond capacity, animals that are brought in are sometimes temporarily housed in individual crates instead of kennel runs. Next Article » Short Takes - The Clinton's Demise? BLUE RIDGE, Ga. – The Fannin County Board of Commissioners (BOC) voted to enter into litigation involving opioids and the impact that these drugs have on Fannin County. At the Feb. 13 BOC meeting, Fannin County Attorney Lynn Doss presented a proposal that the county be represented in a legal case involving pharmaceutical companies and their distributors. Post 2 Commissioner Larry Joe Sosebee signs a contract to enter into litigation regarding the opioid epidemic that has hit Fannin County. “There has been similar litigation about other drugs in the past,” Doss explained, citing the settlements reached from tobacco companies in the late 1990s. On Oct. 27, 2017, the state of Georgia acknowledged the opioid crisis as a public health emergency. Between June 2016 and May 2017, opioid doses prescribed in Georgia reached a soaring 541 million. That roughly breaks down to 54 doses for every man, woman and child in the state. “It’s real. It’s here in Fannin County,” Fannin County Chairman Stan Helton spoke of the need for the county to acknowledge and address this ongoing epidemic. 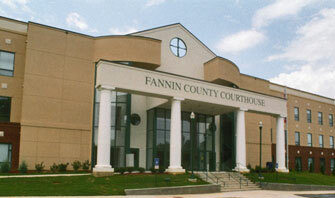 The statistics for Fannin County are even higher than that of the state average. According to the Centers for Disease Control and Prevention, the prescribing rate in Fannin County for 2016 was 154.3 doses per 100 people. The national prescribing rate in 2016 was 66.5 doses per 100 people, and the rate for the state of Georgia was 77.8 per 100 people. Fannin County also saw five deaths due to overdose in 2016. “In this county, if you take law enforcement, the jail, you take the court system, this county puts in over five million dollars a year in all those different segments,” Helton said of areas in our county where taxpayers can directly see a loss due to this ongoing crisis. Marc J. Bern and Partners, LLP will be representing the county in this suit. 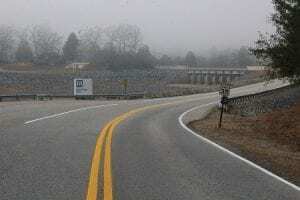 The agreement of the contract with this firm is that they will provide all upfront costs and would receive 25 percent of any settlement that Fannin County is awarded. “There is absolutely no money out of pocket for Fannin County,” Doss assured the board. “This is personal for me,” Fannin County Post 1 Commissioner Earl Johnson said, expressing his thoughts on the crisis itself. Johnson stated it is not uncommon for workers in the construction industry to be prescribed opioids due to injury from accident. Fannin County Post 2 Commissioner Larry Joe Sosebee motioned that the county enter into litigation concerning the opioid impact on our area, with Johnson seconding Sosebee’s motion. The board voted unanimously in favor of moving forward. Doss could not give an exact timeline, but estimated that if the suit were successful, Fannin County could start recouping monies lost in two to three years. 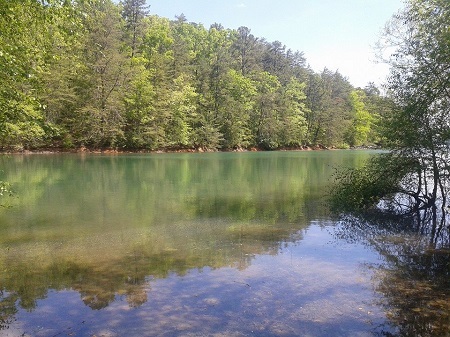 BLUE RIDGE, Ga. – Fannin County could see improvements to local hiking trails. At the Nov. 28 Board of Commissioners (BOC) meeting, commissioners took steps to help secure funding for the Lake Blue Ridge Hiking Trail. This area includes the Green Creek Campground. “It’s a beautiful little area, but it hasn’t been utilized in quite some time,” Fannin County BOC Chairman Stan Helton remarked. A view from Lake Blue Ridge Hiking Trail. “The Development Authority has been working on an arrangement with the Forest Service where we would improve areas, the trailheads, make some ADA (Americans with Disabilities Act) accessibility along this trail,” Helton explained. If obtained, the county would have to finance the projects up to $200,000. The grant would then make reimbursements to the county for 80 percent of funds spent. The commissioners unanimously agreed to sign a resolution, which will allow the Development Authority to move forward with the application process to acquire grant money for improvements to the Lake Blue Ridge trail. Director of Fannin County Parks and Recreation Eddie O’Neal was present at the meeting to submit a five-year contract renewal to the commissioners. This contract renewal would make Coca-Cola the exclusive provider of beverages for Fannin County concessions. Coca-Cola recently reinstated a program to provide scoreboards for counties who choose Coca-Cola as their main supplier. In the contract renewal, Coca-Cola will provide Fannin County with three new LED scoreboards. Eddie O’Neal discusses renewal of Coca-Cola contract with BOC. To this, O’Neal responded that Coca-Cola would indeed be responsible for repairs. Two of these scoreboards will be delivered in 2018, and the third will come in 2019. O’Neal explained that Coca-Cola had the option of increasing the price by three percent each year, but could not go over that percentage. BOC Chairman Stan Helton motioned to sign the contract, Johnson seconded the motion and all three commissioners approved the renewal of the Coca-Cola contract with the county. 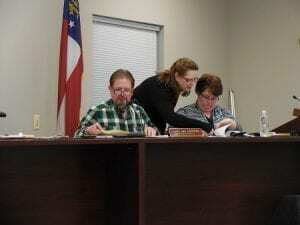 Christmas bonuses for county employees were also approved. Helton and Post 2 Commissioner Larry Joe Sosebee discussed staying with tradition and approving $100 bonuses for all county employees. Helton asked Johnson for his input on the bonuses to which Johnson replied, “I’m not going to be Ebenezer.” The bonuses were unanimously approved by the board. Finance Director Robin Gazaway sought approval for the opening of two new bank accounts to earmark certain percentages of SPLOST funds for specific projects. Discussion of these accounts lead Johnson to bring forward a long standing issue he has had with the hotel/motel tax being deposited into the general fund. Johnson would like to be able to present the public with a more accurate account of where this money is being spent. All commissioners agreed this is an issue that should be addressed and would like to discuss setting up a public workshop on the matter in early 2018. Johnson also took time at the end of the meeting to discuss items brought up at the Nov. 14 BOC meeting. He questioned when the commissioners would address whether or not County Attorney Lynn Doss would represent the entire board or would continue to only represent the BOC Chairman. Sosebee felt that this matter would be better resolved if addressed after the passing of the 2018 Budget and after the holidays. Sosebee and Johnson agreed to revisit the issue in the beginning of the new year.